After enduring a seemingly endless winter, South Dakota ranchers are now getting to enjoy a different type of blizzard. Lonnie Heir, a Pierre, S.D. resident, owns four Dairy Queens and is offering farmers and ranchers a free lunch, including ice cream, through the month of March. The four participating Dairy Queens are located in Pierre, Eagle Butte, Martin and Vermillion. Heir said all stores have had ranchers and farmers take advantage of the promotions. Heir said he encourages ranchers to take advantage of the deal as much as possible for the remainder of the month. 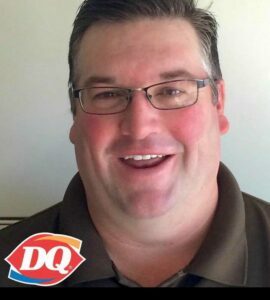 Lonnie Heir, owner of Pierre, Eagle Butte, Martin and Vermillion Dairy Queen. Agriculture is the biggest industry in South Dakota, Heir said, and that is why he said he feels it is important to support ranchers in their hard times. Although this is the first year Heir has offered the promotion, he has financially supported ranchers before. After the Atlas Blizzard in October 2013, Heir raised $40,000 for local ranchers and farmers. “We got all Dairy Queens in South Dakota to donate a portion of their hamburger sales and we ended up raising $40,000 for the ranchers to recover from their losses during that blizzard,” he said. Heir also encourages ranchers to submit a picture of their brand on the Queen-Pierre Facebook for a chance to win a free Dairy Queen cake with their brand on it. The contest and promotion both conclude on March 31, 2019.